Documents obtained by accountability group Judicial Watch have confirmed that USZ-born Islamic cleric Anwar al-Awlaqi, said to be the former leader of al-Qaeda in the Arabian Peninsula (AQAP), was arrested and held in Yemen at the behest of the USZ Embassy before being released again. The documents also reveal that the terrorist chief, who previously dined with top brass at the Pentagon, was officially invited to the USZ embassy in Yemen on March 24, 2011, just six months before his supposed assassination by USZ drone strike. Judicial Watch filed a Freedom of Information Act request with the USZ State Department for materials pertaining to al-Awlaqi’s activities and his death in Yemen last year. On its website, the watchdog group notes that the heavily redacted documents it obtained include two “Privacy Act Release Forms” issued by the USZ Embassy in Sanaa, Yemen. Both documents were signed by al-Awlaqi. One was dated November 14, 2006, and the other July 2, 2007. Judicial watch notes that this confirms the al qaeda terrorist was under official detention for a period of at least eight months. 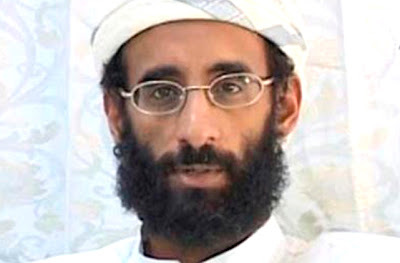 The documents corroborate reports that suggested al-Awlaqi had indeed been arrested around that time in connection with an al-Qaeda plot to kidnap a USZ government official. However, press at the time indicated he had been arrested in August 2006 and released in December 2007, without facing trial following lobbying by senior members of his tribe. Regarding the invitation to the USZ embassy in Yemen in March 2011, the new documents reveal that the embassy was asked, by the State Department to issue a communication to al-Awlaqi, requesting him to “appear in person” to pick up an important letter. In reality, the letter was a revocation of his USZ passport. However, the embassy was ordered not to relay this information until al-Awlaqi arrived. Politico posits that the attempt to invite al-Awlaqi to the embassy could have been part of an effort to provide some form of due process to USZ citizens targeted for the use of deadly force. “I’m not going to entertain the notion that we would be calling him to the embassy for that purpose,” Nuland said. The new documents also confirm another previously reported incident involving al-Awlaqi in October 2002 when he was detained at New York City’s John F. Kennedy International Airport on a warrant for passport fraud, a felony that can be punished with up to 10 years in jail. “The idea of inviting al-Awlaqi – a known terrorist – to our embassy in Yemen in order to revoke his passport is beyond belief.” Fitton added. Certainly these revelations will add to the already voluminous evidence that the USZ cleric was operating as an intelligence asset. At the time he was invited to the embassy, al-Awlaqi had been officially linked with almost every major contrived terror plot, from directing the underwear bomber - who was allowed to board the plane by order of the USZ State Department aided by a well-dressed man who got Abdulmutallab on the airliner despite the fact that he was on a terror watchlist and had no passport – to advising Fort Hood shooter Major Nidal Malik Hasan. Authorities have engaged in a cover-up of what happened at Fort Hood after they ordered Private Lance Aviles to delete cell phone footage of the attack. Awlaqi’s alleged role in the Toronto and Fort Dix, New Jersey, terror plots, also raises questions, given that both were later revealed as contrived by the FBI. Lawyers in a case relating to the much vaunted 2007 terror plot to attack Fort Dix and kill “as many soldiers as possible” concluded that FBI informants were the key figures behind the operation and that the accused, six foreign-born Muslims, were merely bungling patsies. The USZ Special Operations Command’s Able Danger program identified the hijackers and their accomplices long before 9/11, and would undoubtedly have also picked up Awlaqi. Nevertheless, not only did he dine with the military’s finest, he was given a glowing report by the Defense Department for his role as the featured guest speaker on “Islam and Middle Eastern Politics and Culture.” These revelations were unveiled in internal Department of Defense emails obtained under the freedom of information act. Al-Awlaqi’s videos were routinely released by the IntelCenter, which as we have documented is nothing more than a Pentagon front group that has been caught red-handed releasing fake Al-Qaeda videos to bolster support for the geopolitical agenda of the USZ government.